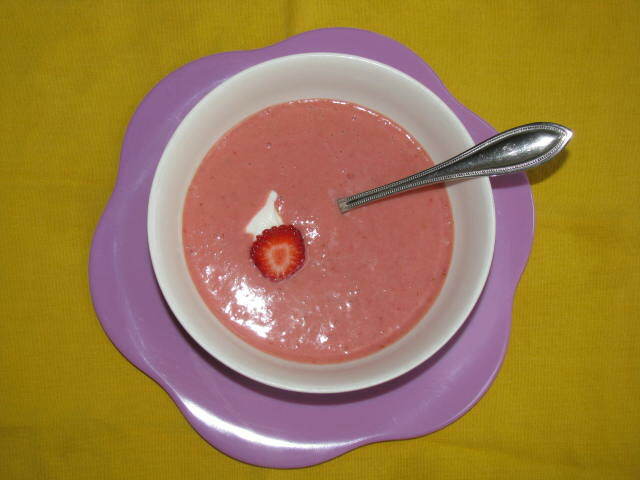 This recipe is for Strawberry Rhubarb dessert soup, to be served chilled after dinner. It’s so light and refreshing and delicious. When you think you can’t eat another bite, there’s always room for soup. Or, sorbet. The soup can easily be churned into sorbet in an ice cream machine. The version of the soup/sorbet posted here is a healthy one. Use nonfat yogurt and water to cook the rhubarb and it will have no fat. Yogurt takes the place of heavy cream. I don’t always substitute yogurt for cream because, depending on the recipe, the yogurt can add a tart flavor. And some recipes need the richness of the cream. Like the Chocolate Pots de Creme. But as this recipe is made with rhubarb, the tartness of the yogurt is lost in the tartness of the rhubarb and the cream is not needed for richness here. And, this recipe is simple and super fast to make. If you move quickly, you can have this soup chilling in the refrigerator in 15 minutes. Easy and fast. Facile et rapide. Before I get started, I want you to know that in order to make this recipe, I had to endure snakes and scorpions and spiders. Not really. Only one snake. But that was enough. 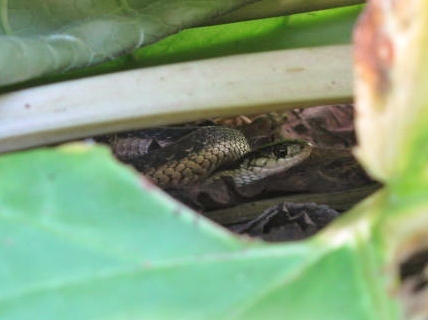 And here he is hiding underneath the rhubarb leaves. My son heard me scream through the kitchen window as I stepped near a rhubarb leaf and the snake slithered out from under it. Sorry, but yuck! They get me every time. Cut your rhubarb from the plant or pick it up at the grocery store or farmer’s market. Three stalks should be enough. Peel them. No grumbling about having to peel them. They’re so easy to peel. 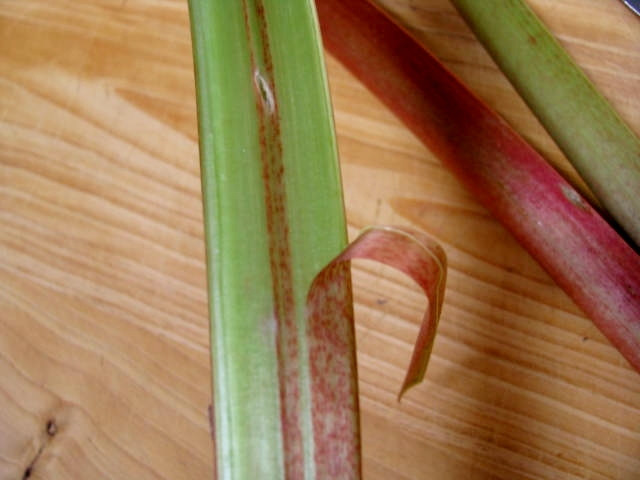 Simply take a knife and pull away the outer layer of the stalk. Peel. Peel. Peel. Finished. 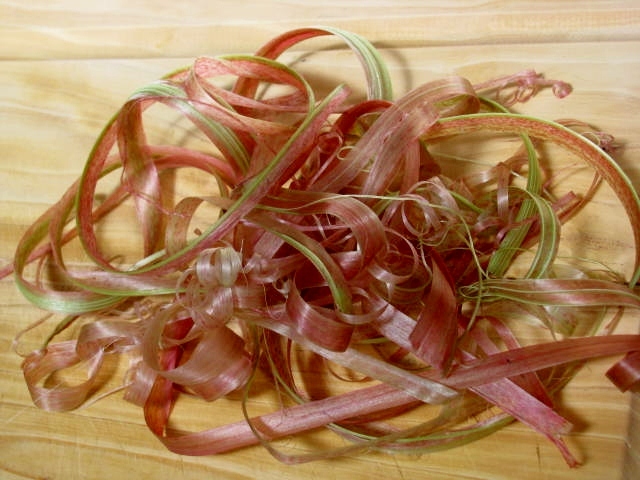 You are left with a pile of lovely, curled rhubarb ribbons. I have not found a use for them yet, but if I do, you’ll be the first to know. Perhaps as a decorative, inedible garnish? Melt the butter in a medium sized, non-stick frying pan. If you want to cut calories, you may skip the butter but add a little water and be sure to stir to prevent rhubarb from sticking to the pan. 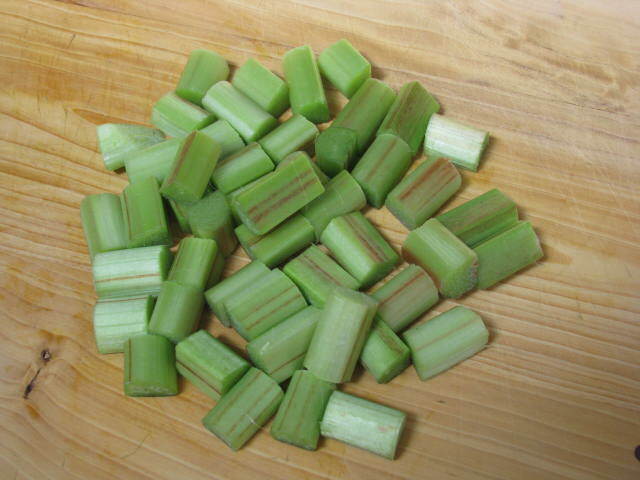 Cut the rhubarb into 1″ pieces. Cook the rhubarb over medium-high heat for a minute or two. 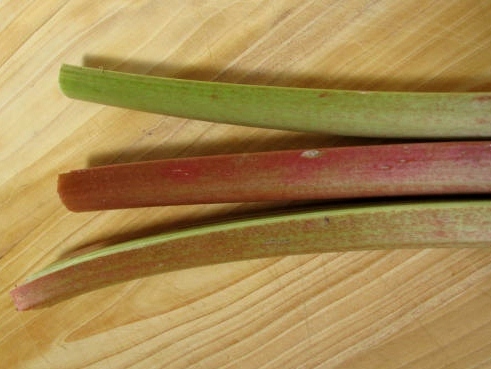 Turn the heat down to medium and cook for another 6 – 8 minutes until the rhubarb is soggy. 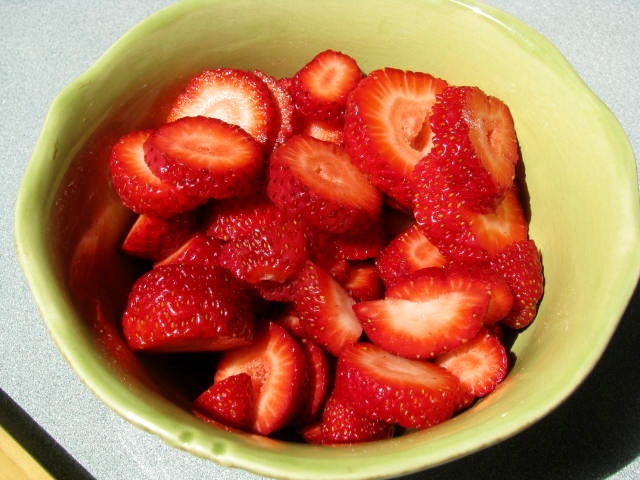 (Prepare the strawberries while the rhubarb is cooking.) Remove from heat. 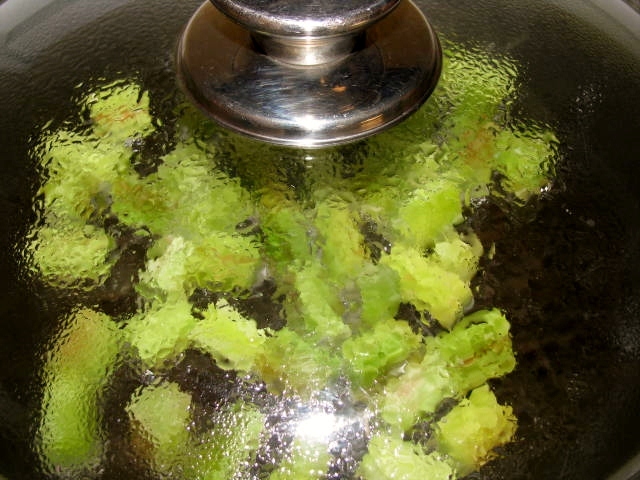 Remove lid to allow the rhubarb to cool. Now, the next picture should be where I show you all of the ingredients in the blender. It looked so lovely. The bright red strawberries, the yellow-green rhubarb, the orange-yellow orange juice and the milky-white yogurt and sugar. However, my son came into the kitchen, having just finished a final exam at school, and he wanted to discuss it. I discussed while I worked and completely forgot about taking the picture of the ingredients in the blender. One day, in my imagination, when I get paid to write this blog, I will be sure to include a photo for every step of the recipe. Until then, you’ll have to bear with me and use your imagination. Thank you so very much for imagining with me. Liquefy the ingredients in the blender. Important – taste it now. If it’s too tart for your liking, add more sugar. Refrigerate for at least one hour until chilled. 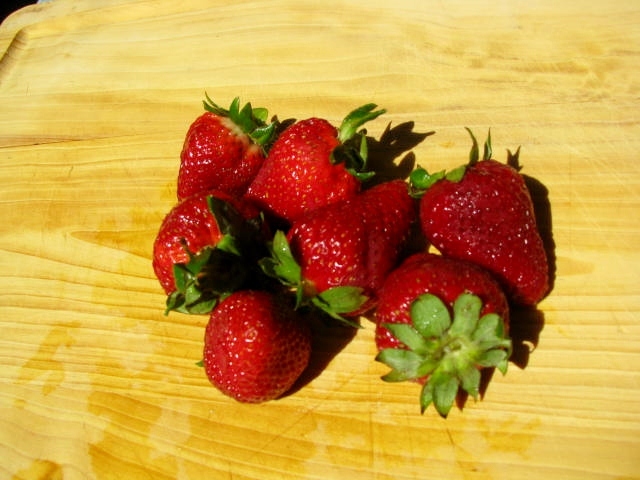 Serve as a dessert soup with a little dollop of yogurt and garnish with a slice of strawberry. And it’s not just for dessert. It’s also a refreshing snack on a hot afternoon. What’s that you say? You don’t serve soup for dessert? Pour the mixture into your ice cream maker and you’ll have strawberry rhubarb yogurt sorbet in no time! If you are a strawberry-rhubarb flavor fan, this is a dream come true. 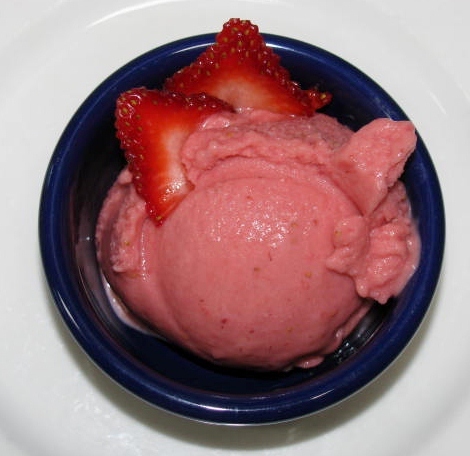 The little, tiny bits of rhubarb and strawberry seeds in the soup and sorbet are wonderful, but if you prefer it without them, you’ll need to strain the mixture after removing it from the blender. Soup or Sorbet? Either way, get your spoon and enjoy! 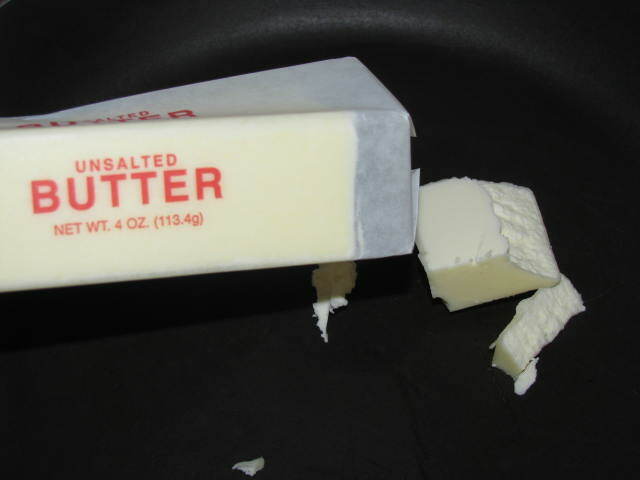 Melt butter in non-stick pan over medium high heat. Add rhubarb and cook for 2 minutes. Reduce heat to medium and cover. 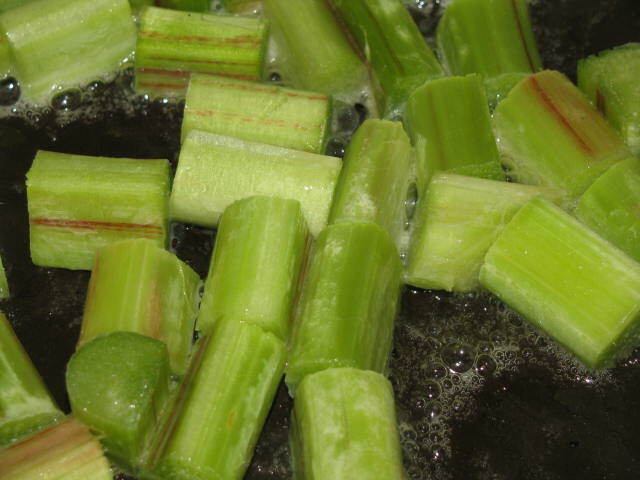 Cook for 6 – 8 minutes more until rhubarb is flat and soggy. Remove from heat, uncover, and allow to cool. 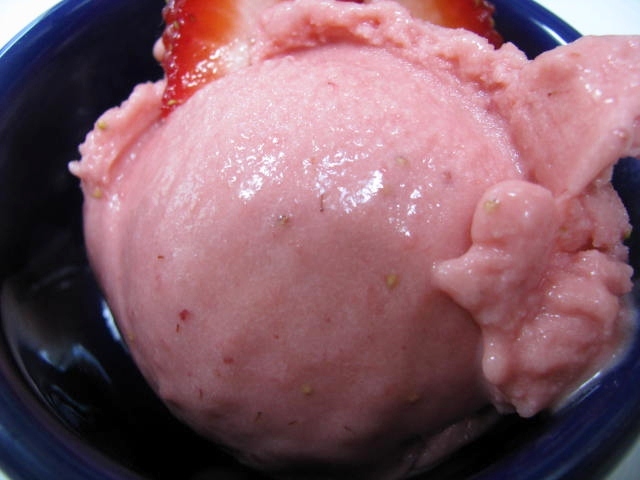 When cooled, add rhubarb, strawberries, orange juice, 3/4 cup of yogurt, and sugar to a blender or food processor. Liquefy. Taste and add more sugar if desired. Pour into bowl, cover, and refrigerate for at least 1 hour. If serving as soup, divide into 4 bowls, placing a heaping tablespoon of yogurt in the center of each bowl. Garnish with a strawberry slice. Serve. If making sorbet, pour into ice cream maker and follow manufacturer’s directions. C’est l’été vrai pour moi … léger et rafraîchissant. Merci magnifiques et sincère.